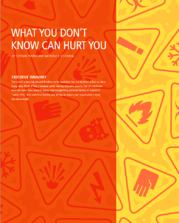 Industrial Engineer Magazine recently featured an article by Select International titled "What You Don't Know Can Hurt You," written by Esteban Tristan, Ph.D. and Matthew O'Connell, Ph.D. The article discusses how the rate of serious injuries and fatalies in the workplace has not declined as fast as minor injury rates. Much of this is because safety training programs assume that all employees react the same. New research shows that incorporating personal factors, or a person's "Safety DNA", into workforce training and hiring can reduce your organization's injury rate dramatically.